The World’s Most Precise Clock Investigates Time « Adafruit Industries – Makers, hackers, artists, designers and engineers! The question Jun Ye gets asked the most is: why would you want to make the world’s most precise clock? For many of us, who live our lives by the day, hour or, if we’re lucky, by the moment, it’s difficult to understand the use in splitting time up into smaller and smaller chunks. But as the Colorado University, Boulder physics professor explained to me over Skype, the endeavor of studying time is anything but futile. Time, Ye said, isn’t just at the heart of everything we do, but at the very core of understanding how the universe functions. “Time is one of the most fundamental tools that connects us to nature” Ye said. The passage of the sun across the sky allowed ancient Egyptians to track their work hours, the pull of gravity kept pendulum clocks ticking to allow seafarers to navigate the oceans, and the vibration of quartz under stress brought timekeeping on to people’s wrists. 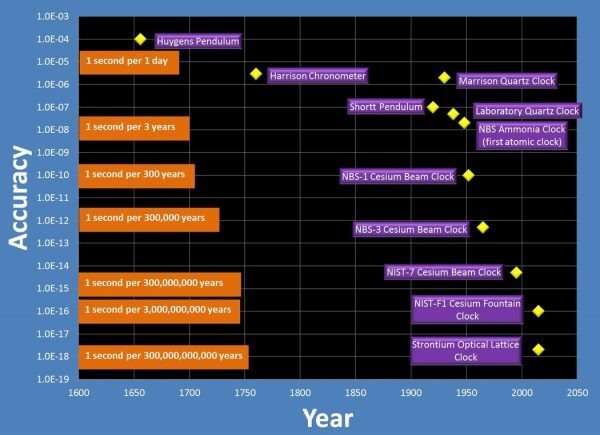 Measuring time has always been at the heart of human society, Ye explained, but how we do that has changed considerably. As measurements became more precise, scientists discovered that these natural timekeepers were fickle and inconsistent. They searched for clock mechanisms that wouldn’t fall behind or need to be reset as often. The search led physicists to atoms, which “tick” naturally thanks to their physical properties. Inside each atom are even smaller particles that are arranged like a solar system. In the core are protons and neutrons, the sun, and orbiting them at increasing distances are electrons, the planets. In the tiny, subatomic world, atoms obey the laws of quantum physics. Electrons can jump between orbits and, when they do, they give off or absorb a tiny jolt of microwave radiation and change into a different energy state. This happens many times every second and each jump back and forth is the atom’s transition frequency, or clock tick.